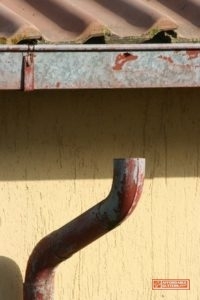 Rust spots and separation indicate that you need new gutters. Though properly installed systems can last for decades, the day does arrive when your home needs new gutters. If you see any of the following signs, it’s time to evaluate your gutters’ overall effectiveness. To learn more or schedule service in Canton, GA or surrounding areas, don’t hesitate to call us at 770-735-4433. Inspect your gutters closely. If you see more than a few cracks, holes, or rusted areas, you want to invest in new gutters. Also, check for broken fasteners and nails or screws along the ground. A few instances of these can get repaired, but an abundance indicates problems with the gutters themselves. Gutters only function when they provide a continuous channel for water. If your gutters have begun to separate at the seams, it’s time for new seamless rain gutters from Affordable Gutters Plus. If your gutters continually separate from the roof, it can indicate rotted fascia. Also, gutters that do not have a proper pitch will function improperly. If you notice water overflowing from the sides, it’s time for replacement. Your home itself can offer several signs that you may need new gutters. If your exterior paint has begun to peel, it can indicate leaks from your gutters. Any standing pools of water around the exterior also signify malfunctioning gutters, as do dirt splatters on the side of your house. Lastly, if you have trouble with floods in your basement, you can possibly point the finger at your gutters. As gutters fail to work properly, water can pool around your foundation, then work its way down into the basement. Remember, gutters exist to protect your home. Improperly functioning gutters leave your home vulnerable to excess rainfall and flooding. If you think you may need new gutters, trust Affordable Gutters Plus to do the job right. For more information, contact us at 770-735-4433. Posted in Uncategorized on April 20, 2017 at 3:17 pm by Affordable Gutters Plus LLC.